1. 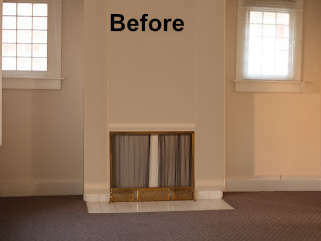 Replaced the original carpet with dark walnut wood flooring to ground the room with a timeless classic style. 2. Removed the drop ceiling to make the space airy. 3. Installed wall panels and painted them in Tiffany Blue—fashionable yet classy. All moldings and trims were also painted in Tiffany Blue. Applying the same color on the trims and walls will unify the whole room and create tranquil backdrop for the later furnishings. 4. Installed new marble mantle. The color and the vein on the marble are kind of talking to the rest furnishings. 5. Applied different shades and textures of cream and gray on furniture to layer the space without tiring eyes. 6. Furnishing the room with modern pieces such as the art over the fireplace and tailored light-gray roman shades. 7. The big floral pattern on the area rug contrasts with all neutrals and adds a sense of playfulness. 8. Fresh floral arrangements and green plants bring the life into the space. Please let us know what you think. If you are interested in getting the whole room look or any pieces we used here, please email us at y.a.hong@hotmail.com.